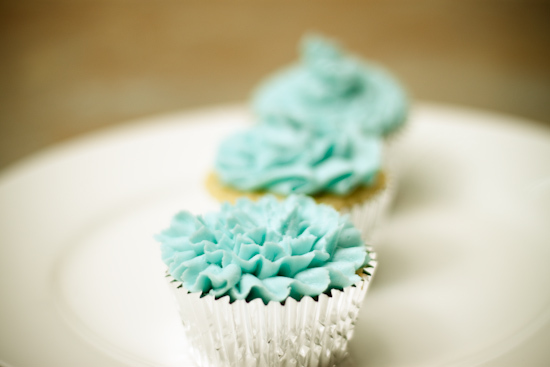 Strawberry Chic: DIY Tuesday: Easy Frosting Technique for Cupcakes! 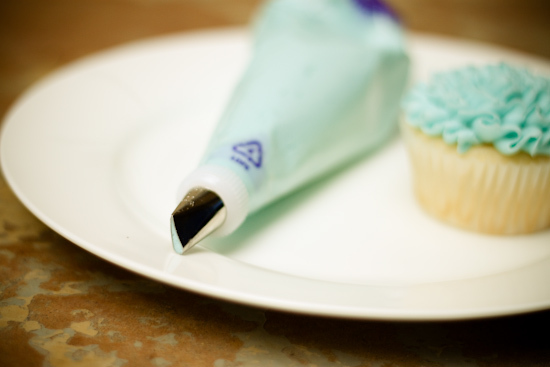 DIY Tuesday: Easy Frosting Technique for Cupcakes! because here is another one only this time it's a technique used for frosting cupcakes! Last week I baked up a quick batch of cupcakes for a picnic. I wanted to do something fun with the frosting so, I started experimenting with my 104 Wilton frosting tip to see what sort of different designs I could make with it. When I realized that I could make a rather pretty flower pattern with the 104 tip I was super excited and immediately grabbed my husband (who just happened to come home for a lunch break) and had him shoot a quick video tutorial of this frosting technique so I could share it with all of you! The video was actually done in our backyard...I don't have any video editing programs so please forgive the lovely birds chirping in the background! So basically, I just used my #104 Wilton frosting tip , and placed it inside of my frosting bag. Then, I filled the bag with colored Buttercream Frosting. 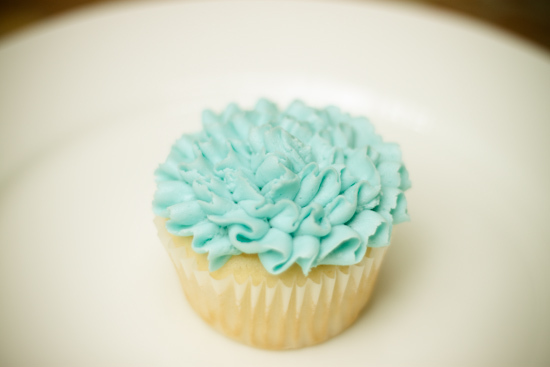 With the skinny end of the tip facing up, and the fat end closest to the cupcake, I made a wave-like pattern all the way around the cupcake and ended in the center. 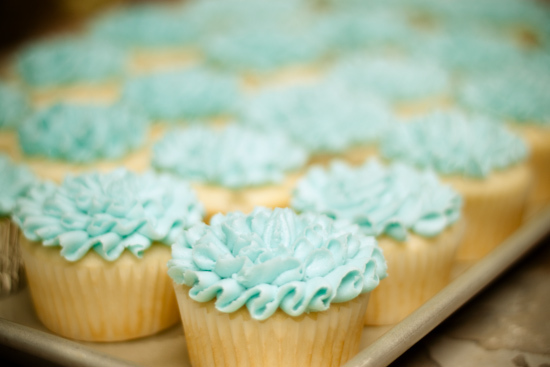 The technique is actually very similar to the "Ruffle Frosting Technique" I posted previously, only you tilt the frosting tip at a slight angle. I hope that video tutorial was helpful, frosting techniques are a little hard to show with just photos, so I thought this would be nice for a change! By the way, don't forget to enter my GIVEAWAY for the "Best Bites - Mormon Moms In The Kitchen" cookbook go HERE for details! LOVE this!! You are the frosting queen!! 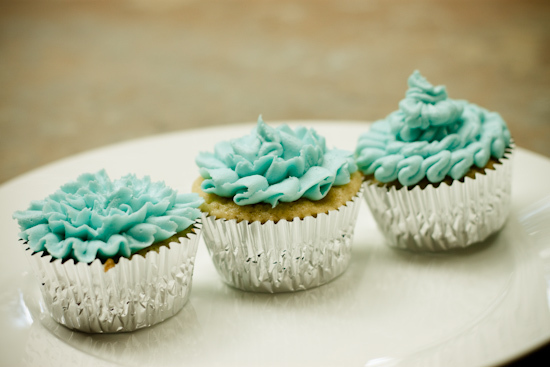 Ooh, lovely cupcakes, thanks for the tutorial! Thanks for sharing! You are so handy! I probably would have dropped the cupcake. lovely! did you see that I featured you twice on Sunday at the Craft Schooling Sunday features? Would love to see you again, and the video sure does help! all the best! That is beautiful! I love it! I'm going to try it next time I make cupcakes. thanks so much for sharing on Craft Schooling Sunday! I have no experience with frosting but you've inspired me! all the best! My decorating tips, my maternal grandmother's iron skillet, and two of my paternal grandmother's wedding plates were the only kitchen things I brought with me to England from the states. I LOVE my kitchen stuff. My kids loved it when I was learning my decorating techniques.....I used the leaf tip and make an entire cake top of nothing but green leaves....They called it my Kudzu Cake and they STILL expect it for Halloween with those tiny candy pumpkins here and there on it so it looks like a Pumpkin Patch! Jennifer, Yes I almost always make the buttercream frosting. I do love store bought frosting but haven't used it for any type of cake decorating.